There are good reasons for you wanting to run Microsoft Edge on Windows 7 or another non-Windows 10 version of Windows. If you are a web developer, you may want to test websites and projects for compatibility purposes. Do the sites load and look fine on Edge? If you are a user, you may like the bare bones nature of Edge, or that it promises better battery life when run on mobile devices than other browsers. 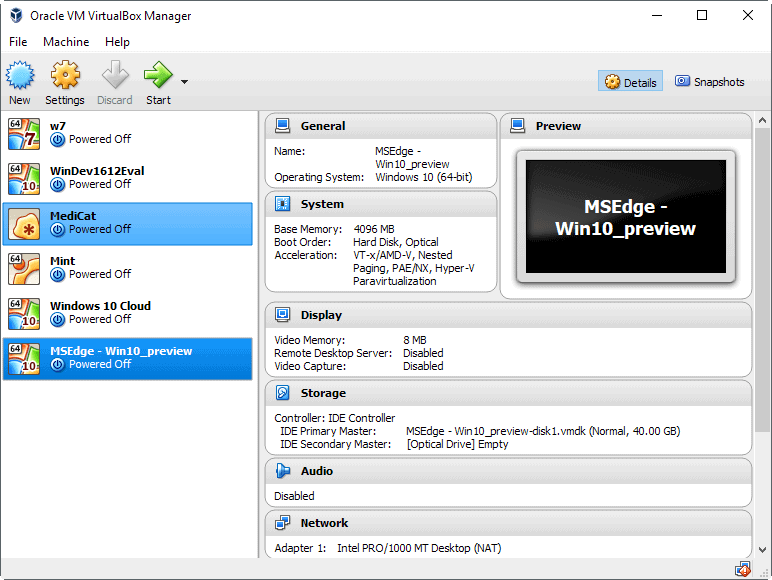 You have two main options when it comes to running Edge on Windows 7 or another operating system that is not Windows 10. Use virtual machines for that. 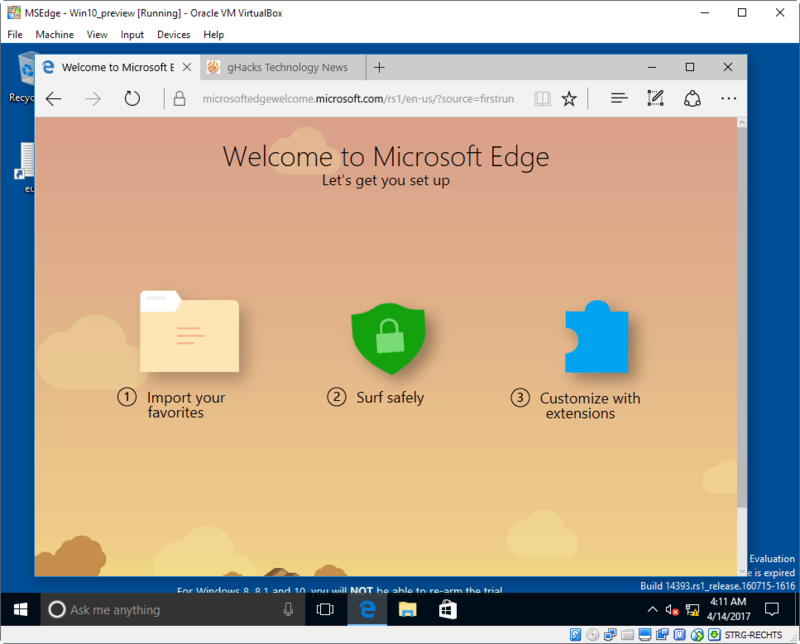 You can download a virtual machine image to your local system from Microsoft that provides you with access to Microsoft Edge. Simply visit the Microsoft Edge website, and there the Tools > VMs section. 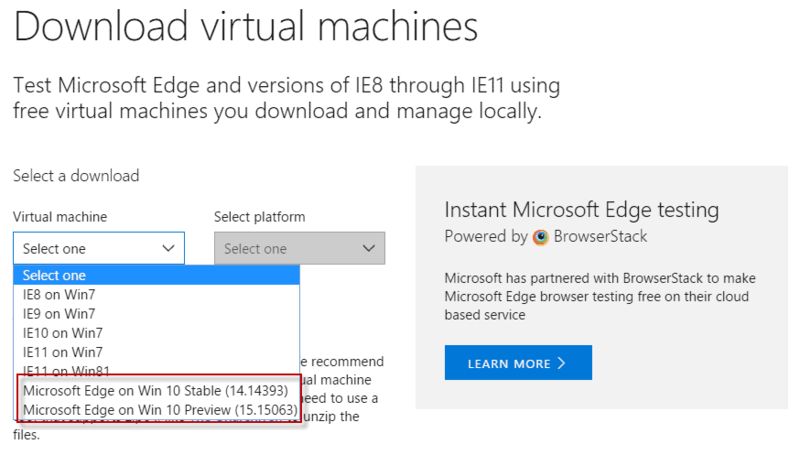 Microsoft offers virtual machine images for all its browsers from Internet Explorer 8 all the way to Internet Explorer 11 and Microsoft Edge. Tip: You may download a 90-day trial of Windows 10 Enterprise from Microsoft, and install it on a virtual machine as well. The process requires a bit more work though as you have to set up everything manually. Still, it is another option that you have. Microsoft Edge is offered as a stable version and as a preview version. The stable version has not been updated yet for the Creators Update release at the time of writing. This is probably going to happen soon though. 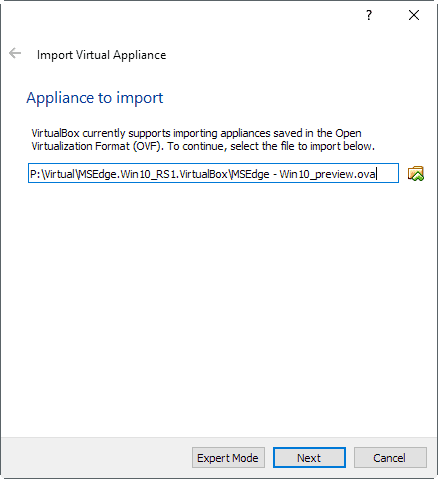 Once you have selected one of the available Edge virtual machine images, you are asked to select the VM platform that you want to run it on. Available are VirtualBox, Vagrant, Hyper-V, VMware and Parallels. You need the VM software installed on your machine to load the VM image. You can grab a free copy of VirtualBox from the official website for instance. Downloads are provided as zipped archive files. They are quite large, the version for VirtualBox for instance has a size of 4 Gigabytes. You need archive software, such as Bandizip, 7-Zip or Winrar to unpack the archive once you have downloaded it. Some versions of Windows ship with zip software; if that is the case, you may simply right-click the downloaded image and select the extract option without using third-party software. The virtual machine images expire automatically after 90 days. Microsoft recommends creating a snapshot of the installation so that you can go back to it later without having to download the virtual machine file again. The file that you get has the .ova extension (if you picked the VirtualBox image). Open VirtualBox to get started, and select File > Import Appliance from the menu bar. You may use the shortcut Ctrl-I instead to open it. Select the next button. VirtualBox displays configuration information on the next page. These highlight the operating system type (Windows 10 for Edge), the RAM assigned to the virtual environment, and other hardware information. You can make changes here to modify settings, for instance by lowering the RAM, or disabling DVD support. Microsoft recommends that the virtual environment has at least 2 Gigabytes of RAM at its disposal. Once you are done going through the configuration and modifying preferences as you see fit, click on import to start the installation process. This may take a couple of minutes. 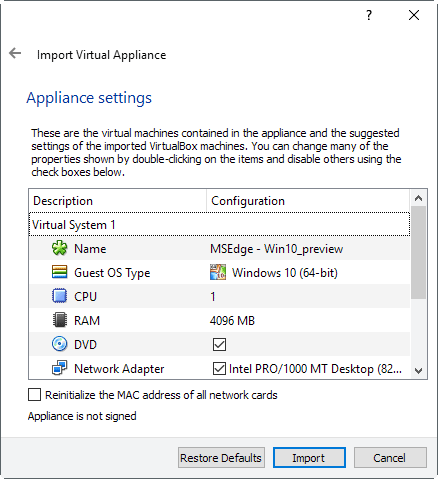 You may start the virtual machine then with a double-click on it. Windows 10 loads then, and you should be taken directly to the desktop. There you find information on the user account — username is IEUser, password is Passw0rd! — and other information that highlight how to re-arm the operating system, activate the copy, and a hint that you should create a snapshot or backup to avoid expiration of the image after 90 days. You can run Microsoft Edge with a click on e-icon on the Windows taskbar. You may use Edge like you would on a regular installation of Windows. Install extensions, modify preferences, or use the built-in Developer Tools the browser ships with. 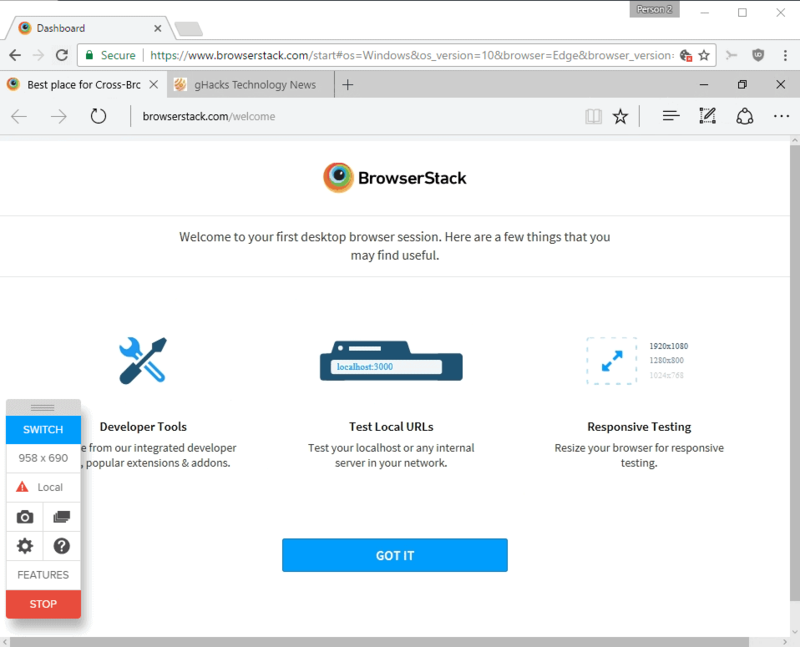 BrowserStack, in cooperation with Microsoft, offers free live cloud testing of Microsoft Edge, and Selenium Cloud Testing of the browser. The main benefit of this approach is that you don’t have to download a large virtual image file or operating system image to your computer, and run it locally. BrowserStack provides the virtual images, and it is usually a much faster process to get started. Downside is that you need to create a free account on the BrowserStack website before the option becomes available. 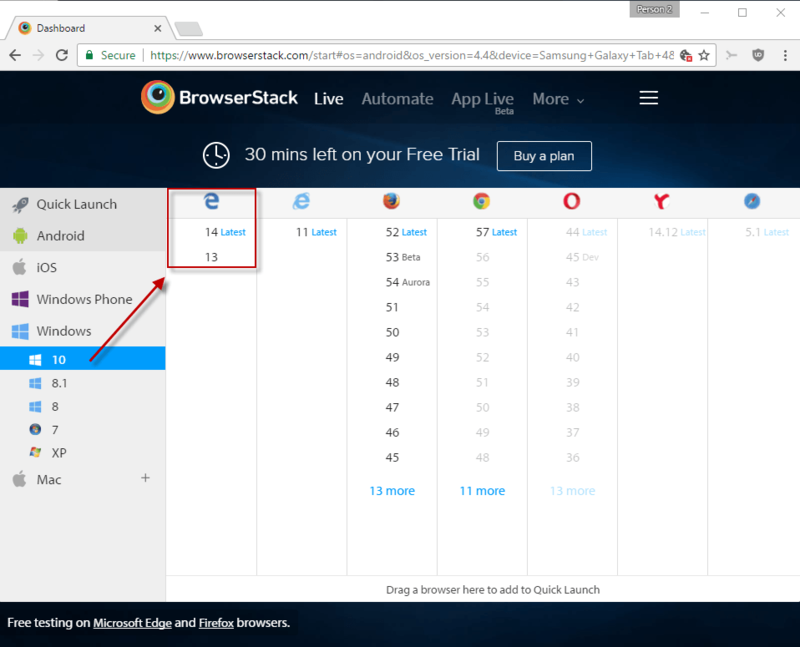 Free plans are limited to 30 minutes usually, but there is no limit for running Edge on BrowserStack thanks to the partnership. Select Windows 10 in the operating system selection menu on the site afterwards, and then one of the available Microsoft Edge versions. BrowserStack launches Microsoft Edge than in the browser you are using to access the site. You may notice that there is a little bit of lag involved. That’s one of the disadvantages of using the BrowserStack solution to run Microsoft Edge, as you won’t get the same kind of lag if you run Edge in a virtual machine provided the machine itself is capable enough to handle this. While you may not be able to install Microsoft Edge on Windows 7, Windows 8 or other operating systems directly, you can at least run the web browser on those operating systems using virtual machines, or the BrowserStack offering. This entry was posted on Monday, April 24th, 2017 at 10:13 am	and is filed under tech tips. You can follow any responses to this entry through the RSS 2.0 feed. Both comments and pings are currently closed.